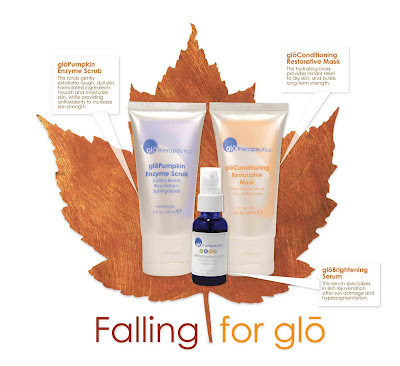 There's plenty new to be excited about with glotherapeutics this season with the upcoming launch of five new gloAdvanced products on October 15th (we'll talk more about that soon!) But with Labor Day behind us and cool days and nights ahead of us, it's a great time to indulge in some delciously nurturing glotherapeutics favorites. Polish away unhealthy cells with the gloPumpkin Enzyme Scrub while that rich pumpkin spiced cinnamon scent invites you to relaxation. Relieve dry skin with the gloConditioning Restorative Mask which harnesses the restorative strength of wild black cherry bark. And help your skin recover from too much of summer's sun with the gloBrightening Serum which reduces the appearance of sunspots. Breathe deeply and love a little luxury this autumn.